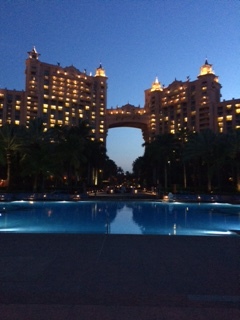 I am so excited to share with my readers tips from my latest family trip to the Atlantis Bahamas Resort. Each week, I will post insider information on the best rooms/tower to stay in, kids activities, places to eat, entertainment, how to make the most out of the casino and overall which places/things are not to be missed! I booked my room this trip in the Royal Tower West. This is the first time I stayed in Royal Tower West (I usually stay in the Royal Tower East). Both Royal Tower East and Royal Tower West have French Balconies (you can open the door and walk out on the balcony to take pictures and selfies but it is not a full balcony that can have chairs on it). Royal Tower West does have a few full balconies on the corner rooms on a few of the floors. West tower is little quieter than the Royal Tower East – elevator banks and general foot traffic was less busy in the West tower. I have stayed in both the East and West tower. 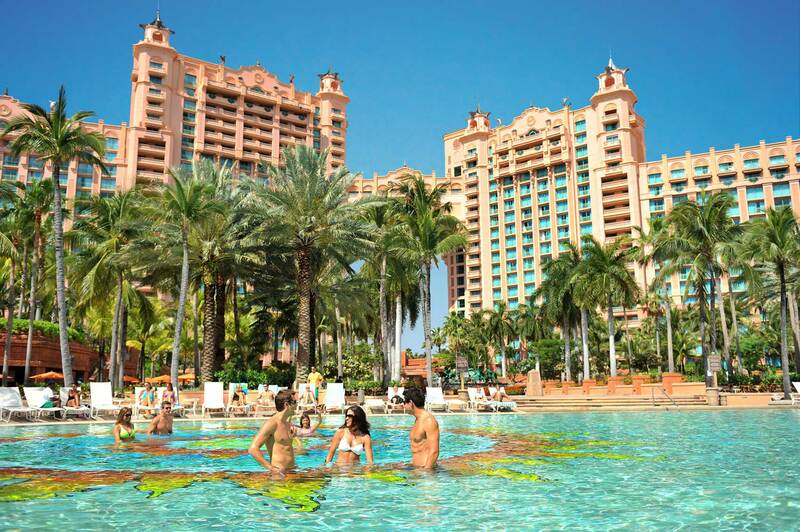 Royal Tower East is also a very central location for the waterpark and main Atlantis attractions and also has spectacular water views. East is slightly closer to the casino and Marina Village. West is perfect if you plan on using the Kids Club and the fitness center. 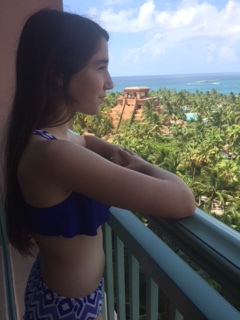 We had a wonderful water view (could see the lush green of the entire resort plus the waterslides and ocean from the balcony). Pleasantly surprised to find 2 comfortable white robes in the closet. Our room had 2 queen beds. We requested a rollaway bed and that is no extra charge. There was plenty of space to move around the room – even with the rollaway bed. Rooms in the West tower with a full balcony are hard to get and go quickly but you can always ask for a balcony room upon check-in and maybe you will get lucky. Pools are open from 9 am to 7 pm (Water-slides open at 10 am). We were there at the end of June (peak summer vacation time) and although we waited in line for most of the slides it was not too long of a wait and the lines go quickly. We liked to park our stuff (towel, sunscreen, room key) at the Royal Baths pool (located very close to Royal Tower West) and then took off for the water-slides. All the water-slides are right there in the resort – very easy! 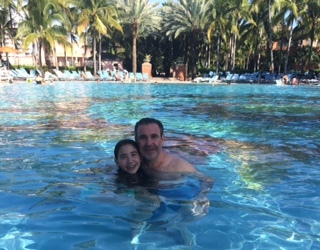 Several times our 12 year old daughter took off to do some rides on her own while my husband and I relaxed at the pool. We also bought a Nerf football for the pool and my daughter and husband loved tossing the football around the Royal Baths pool. Tons of room to play with fun music playing. 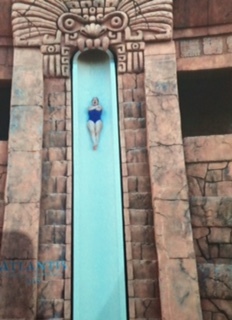 Me on the Leap of Faith slide! With 18 pools and 10 water rides there is something for all ages. The best waterslide and the one you always see on TV is the Leap of Faith. It looks crazy scary and intimidating but trust me – it is a thrill! 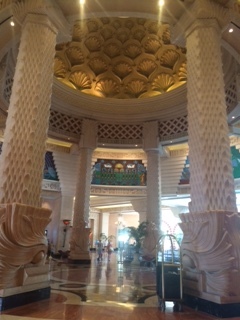 Do not leave the Atlantis without experiencing this ride. I promise you will love it! 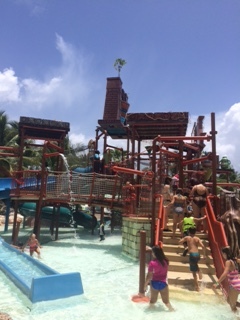 For the little kids (under 48”) there are several kids pools/areas with mini water-slides – almost like a mini version of the big stuff. We loved going on the water-slides at the end of the day (5-6:30 pm) when lines were very short. Several times my daughter and I would ride down and then hop right back in line and go down again. Who can resist going twice in a row when there is no line?! Have to take advantage of this time frame. Stay tuned for the next installment of our guide, Places to Eat!